You might have seen black garlic in specialist shops and wondered what on earth to do with it. The South West Garlic Farm, near where I live in Charmouth, produces it. The garlic bulbs there are very slowly dried at a low temperature for a month, then dried at an ambient temperature for another week. This process lightly caramelises the natural sugars in the garlic cloves and they turn a charcoal-like colour. It can be used in soups, sauces, crushed into a mayonnaise or simply tossed into a vegetable dish like this. Preheat the oven to 220C/gas mark 7. Cook the cauliflower florets and outer leaves in boiling, salted water for about 4-5 minutes, so that it's still a little firm, and drain. 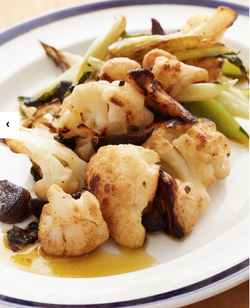 Heat the olive oil in a roasting tray in the oven, add the cauliflower and season. Roast, giving the occasional stir, for about 10-12 minutes, or until lightly browned and then, at the last minute, stir in the butter, black garlic and parsley. Transfer to a serving dish, pouring over the oil and juices from the roasting tray.